Got these as a gift. I was expecting the box to only come with enough legos inside to build one thing at a time. To my surprise all three things shown can be built. Brought them to my office and everyone's been complimenting them and telling me they want to get their own. Took about 10 minutes to build altogether if not less. These are definitely worth it for the price! Great introduction to LEGO and good addition to existing LEGO sets you may already have. A bit limited in complete build options on its own, especially if trying to use up all the pieces in a build. Review by a very satisfied daughter (aged 8) - I really enjoyed building and playing with this set. I was really impressed that you could build all three models at the same time. I loved the fact that you could choose a set based on colour and was impressed by the variety of green shades. This is a really nice creativity box. It contains different shades of green, and have diverse and creative builds. I love the crocodile and castle builds because they are very striking, simple and they look amazing! I am not a big fan of the truck build. I really think they could have put more effort into making it look nicer. Overall, it is a cheap and creative set for children to unleash their imagination, so it is recommended by me! Again, another mini LEGO Creative set that is just perfect for anybody. 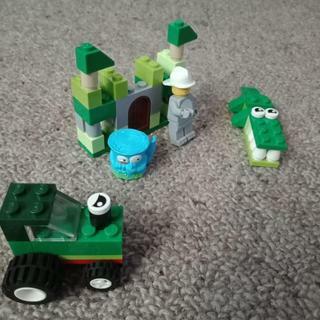 I love the different shades of green in this set, and the 3 little builds are adorable and effective. The set is a great buy for people who want parts, or for someone who can't buy the more expensive sets, this gets the job done. I got this as a gift and i loved it. I think it if good for A stocking or a Easter basket or maybe a small Birthday gift . Or just buy it for your self . So its a good set for the parts and the builds .